This full-color dermatology text provides essential, practical information for solving dermatological problems commonly encountered in small animals. Organized by disorder type, the popular question-and-answer format and detailed index make it easy to find vital information. 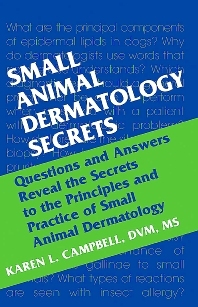 In more than 50 chapters, the expert contributors propose key questions and provide authoritative answers about the diagnosis and treatment of dermatologic conditions relevant to small animal veterinary practice.